Part 1 of 3: What is a Personal Learning Advantage? In the age of information, learning quickly is one of the only sustainable advantages. Today we have so much content available to us literally at our fingertips that we often take it for granted and are overwhelmed with choice. Information becomes stale much faster today as new discoveries, tools, and innovations happen more rapidly. To keep up in the age of information, we need to become extremely efficient, continuous learners. Education is no longer primarily an event of youth. Information doubles every 1.5 years, yet our minds have not evolved to consume more information. In the US alone, there are over 300K books published a year. 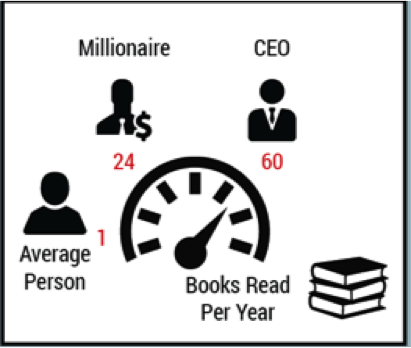 We know that the average person only consumes 1 book a year, while the average millionaire consumes 24, and the average CEO over 60. By capturing more knowledge, insights, and perspectives we are able to be more creative and effective in our endeavors. Learning is changing from an instructor/student format to an automated format where you learn at your fastest personal rate instead of the instructor’s fixed rate. Services like Udemy, Coursera, and others are making the best content available in formats that allow students to have customized learning experiences. In today’s job market where many types of jobs go away and appear, automation driven by machine learning and robotics will continue to change the job market at an alarming pace. A personal learning advantage is driven by our ability to learn new things quickly. It allows us to adapt to this new reality. In the next segment we will dig into creating your own personal learning advantage.